The ACXsynth MIDI2CV Eurorack module is an 8HP, 4 channel CV/Gate interface with a robust feature set you can build yourself! The original circuit and firmware were designed by the talented Alain Coupel of ACXsynth. His design is used here with permission. Dmitry, a forum member, took it upon himself to update the firmware with a slew of new and exciting features! 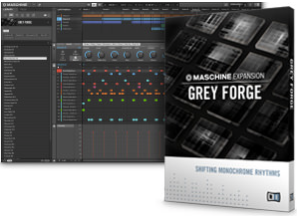 Dominant Drums Maschine Expansion is NOW OUT! Well this one has been a long time coming. I went out and did some extensive on location recordings. I altered drum kits, Bolted on sheets of metal to tom toms, ran them through crazy analog effects, and generally beat the living hell out of everything that I could find to make the best sounding hard hitting drums around. check it out Click the header to head straight over to Bigfishaudio.com! GREY FORGE delivers dark, brooding techno with expressive control for live performance. Here we have the latest in a long line of Native Instruments official expansion packs. This one is designed for a dark techno ambience and I have to say it delivers. The Sounds all have a really nice cohesive flavor to them. One shots ring out with a nice tail and give you a damp dark feeling. Emotive drums that really remind me of just down in the dumps kinda days and the percussion sounds are very easy to mix. Not bad for such easily usable sounds. Highly recommended. This new maschine expansion has been a labor of love. Drums were recorded in a variety of settings using both traditional kits as well as “found sound” kits. The drums were then processed through a variety of outboard gear and optimized for usage in todays top drum sequencing software with a special focus on Native Instruments Maschine. All sounds are individually tagged for easy browsing. Each kit is mapped out with finger drumming in mind! Take a look at Dominant Drums!